Main Street in North Myrtle Beach is the home to award winning shopping, entertainment and dining. It measures one mile and is full of bars, clubs shops and other attractions. Since the early 20th century, Main Street North Myrtle Beach has become an important part of the entertainment and tourism that our area enjoys. The city has grown with a population of over 14,000 residents. Every year, North Myrtle Beach is the home to numerous festivals including Mayfest on Main, St. Patrick’s Day Parade & Festival and the Irish-Italian Festival. Pirate’s Cove is a unique area on Main Street that was built as a bowling alley in 1940. Currently there are an endless amount of options when it comes to food and nightlife. The Golden Griddle and Hoskins Family Restaurant are a great place for down home family breakfast. Flynn’s Irish Tavern is a lunch and dinner hot spot. This former jail is now a bustling tavern with a beer garden providing classic fare & Irish tunes. Duffy Street Seafood Shack serves up burgers, seafood and tropical cocktails. The fish is always fresh and you will enjoy the laid-back setting. 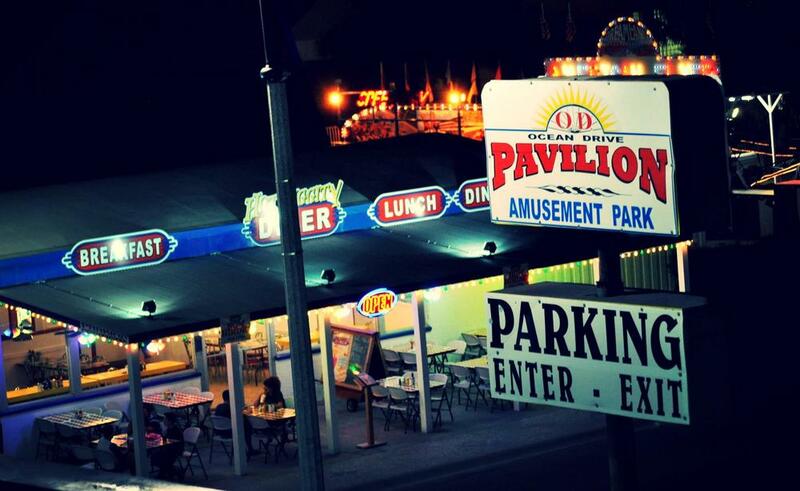 OD Pavilion is an oceanfront amusement park with over 20 ride and games. This is a busy spot for family fun over the summer. They also hold event including the Sounds of Summer Concert Series, Music on Main and Movies At McLean. The OD Pavilion also has a large arcade and ice cream available at the Sugar Shack. North Myrtle Beach is also home to some of the most popular restaurants in the world. Wahlburgers serves Boston style sandwiches and burgers, Paula Deen’s Family Kitchen has fried green tomatoes and Dave & Buster’s, the adult arcade where you can drink beer and play games. Nacho Hippo is a cantina offering flavorful quesadillas and tasty nachos. There are thousands of entertainment options to choose from in North Myrtle Beach. Great Escapes Kayak rentals offer tours around North Myrtle Beach, Myrtle Beach and the area of the Grand Strand of South Carolina. You can choose to rent a kayak for a whole day or just a few hours. Recently they have started to rent out paddle boards as well. Dulpin Winery carries and produces wine of unwavering quality. You can wine taste with friends and visit their store at Barefoot Landing. The Family Kingdom Amusement Park has over 35 rides including the Twist ‘n Shout roller coaster. Go Ape Treetop Adventure is an interactive outdoor experience. You can zip line through the trees and conquer awesome obstacles. Take a stunning helicopter ride through Helicopter Adventures. This is one of the most memorable attractions you will experience in Myrtle Beach. You can participate in three attractions for one price: The Hollywood Wax Museum, Outbreak-Dread the Undead and Hannah’s Maze of Mirrors. Myrtle Beach Family Golf has five themed golf courses including: a jungle safari adventure, a trip to Never-Never Land, a fire breathing dragon, a world of dinosaurs and an island marina. The Myrtle Beach Safari is an unforgettable experience where you can play with tiger cubs, feed the elephants and interact with the world’s biggest cat! Preservation Station at Barefoot Landing also has a living tiger exhibit. For more excitement, Ripley’s 5D Moving Theater is so realistic you will feel like you are in the movie. Ripley’s Believe It or Not Odditorium features the bizarre collection of Robert Ripley. You can see a shrunken human head, the world’s tallest man and a 6-legged pig. Ripley’s Haunted Adventure is a terrifying haunted house guaranteed to scare. Live actors pop out of every corner of this creepy asylum. There are many high-end retail stores and specialty boutique’s in North Myrtle Beach. There are also shopping malls, flea markets and factory outlets. Bargain Beachwear is an affordable store that carried accessories, jewelry, sunglasses, swimwear and towels. Broadway at the Beach has over 350 acres of nightlife, attractions, restaurants, hotels and shops. Carolina Pottery is a lovely home decor store that is over 90,000 square feet. Here you will find the latest trends in home furnishings at low prices. Del Sol carries Disney and Marvel character items that make great souvenirs. The Market Common is an upper-scale shopping center that also includes fine dining. Ron Jon Surf Shop at Broadway at the Beach has been operating for over 50 years. This is the perfect store for those who love the skate and beach lifestyle. Tanger Outlet Center carries the world’s leading brand name and designer apparel. They have the biggest selection of today’s latest trends. Tsunami Surf Shop has five Myrtle Beach locations with one in North Myrtle Beach. They carry the best in surf apparel and accessories by Rip Curl, Roxy, Quiksilver, Salt Life, Billabong, Rainbow, Hurley, Sanuk, Fox, Vans, Oakley, Reef, Costa Del Mar, O’Neill and Nixon. You will find everything you need shopping in North Myrtle Beach.